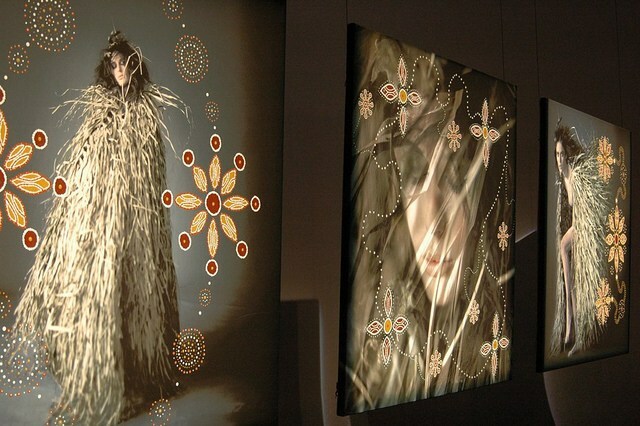 The fashion world merged with the deep cultural background of Australia's Indigenous heritage to create a show of modern music, art and fashion. The politically charged exhibit NOMAD: Two Worlds embodied the positive message of Reconciliation from the ashes of a tragic cultural devastation. The collaborative exhibition focused on the cultural divide experienced by Australia’s Indigenous people, a reality witnessed by fashion photographer and Australian native Russell James. The exhibit featured art, music and film that James has worked with for more than a decade. NOMAD has been on a world tour with the help of some powerful friends this time around. The event is presented by Richard Branson, the mogul of Virgin Airlines and V Australia his newest international airline. Fashion designer Donna Karan joined with URBAN ZEN Foundation, a charitable organization dedicated to the preservation and celebration of Indigenous cultures worldwide. And then Barbra Streisand showed up. A good friend of the fashion philanthropists, the songstress sent the gallery into a frenzy turning the hot spot night into the place to be. James is best known for his provocative work capturing Victoria's Secret models backstage or his work for Sports Illustrated filming some of the most beautiful women in the world on glistening, sandy beaches. NOMAD in L.A. showcases many beautiful women, including Heidi Klum, Adriana Lima and Estella Warren in an underwater video, in sweeping landscapes accented with colorful tribal symbols representative of different spiritual beliefs. The photographs are organic and vibrant while incorporating very modern elements. Australian, Native American and Haitian Indigenous artists, including Australian artist Clifton Bieundurry, have collaborated with James to create a set of hybrid art pieces, many which premiered in L.A. for the first time. The beauty of the pieces is a superficial jump from the engraved faces of Indigenous men of earlier collections. 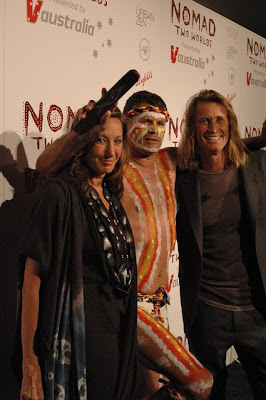 NOMAD: Two Worlds started in 1999 in New York, the project took a pivotal turn when then Prime Minister Kevin Rudd apologized to Indigenous Australians for the mistreatment and genocide by the government endured for generations. The exhibition strives to embrace a long cultural history and move forward with the idea of recovery ad Reconciliation. 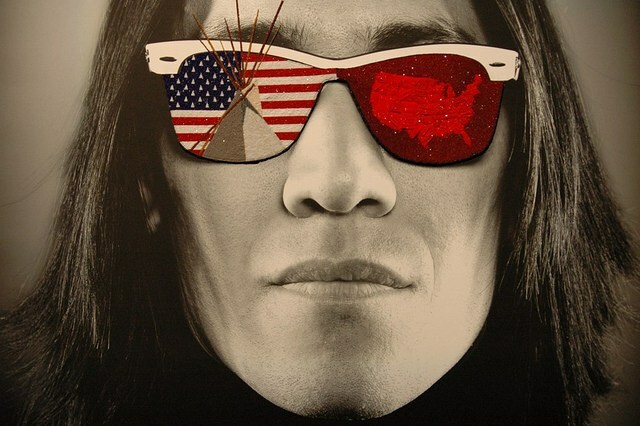 James along with leaders from the Indigenous community joined with Will.i.am of the Black Eyed Peas, Hugh Jackman and Donna Karan to create the first collaborative effort in 2009.